Today it's my turn to show off one of the great new stamps sets from Stampendous. All of the design team will be participating this week on various days and then on one big hop on Saturday. Don't miss it! Stamp the Jump Rope Kiddo image onto white paper and color in with markers. Cut image into a rectangle and mat with coordinating paper. Stamp Hello onto white cardstock scrap and cut into an oval shape and mat with coordinating paper. Stack papers and image as shown. Tie baker’s twine around card front and adhere sentiment. Apply to card base and add paper flower. 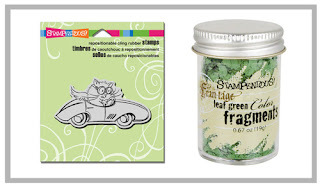 A few of my teammates are showing off new products from Stampendous today as well! Not only do some of them have their own blog candy, Stampendous will be drawing a winner for this great prize pack. Enjoy your day visiting everyone and then I'll see you back here tomorrow. This is so cute--great coloring! Super cute! I think I jump rope with my tongue out, too! Too cute, great job. Love the stamp too! Sweet card! Love the coloring! What an adorable card and image...so simple which is just my style. Very cute card and stamp!! Such an adorable card! Love it! So an adorable card! Love how you set the image off with matching background colors and bakers twine! So, so cute! Love that image and great papers! Love what you've done with our new Kiddo! What a adorable gal, and you've colored her so beautifully! Thanks so much for sharing, Susie!! Super cute!!! She looks adorable! So sweet and Summery! Great colors! What a delightful card! This image is so cute! great coloring and i love your papwer choices. So cute. Love that plaid paper with it! Very cute--perfect for a "hello" type card--love your colors and coloring technique. i love the paper you chose. the coloring is wonderful. love the card. This is so cute...love that image and your cool summery colors! I agree with so many commenters that your paper choices and colors are beautiful and you did a great job coloring that cute girl!